The captain and a crew member of a boat that capsized off Libya on Sunday, killing hundreds of migrants, have been arrested, Italian officials say. The two, held on suspicion of people trafficking, were among 27 survivors who arrived in Sicily late on Monday. The arrests come after the EU set out a package of measures to try to ease the migrant crisis in the Mediterranean. Search and rescue operations will be stepped up and there will be a campaign to destroy traffickers' boats. 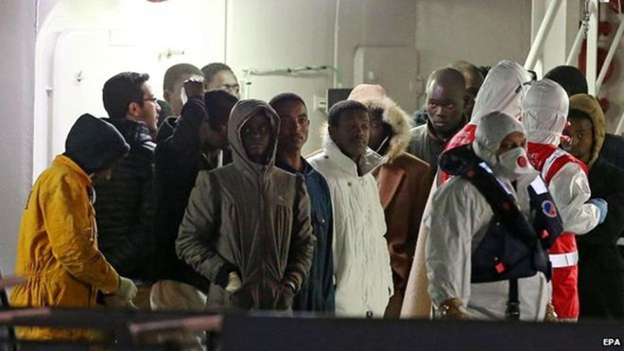 Italian Infrastructure Minister Graziano Delrio said the prosecutor of Catania in Sicily, Giovanni Salvi, had ordered the arrests of the two men who had arrived in the port on a coast guard vessel. Other officials said the pair were the Tunisian captain of the migrant boat and his Syrian first mate. "Prosecutor Salvi has made two arrests this evening of persons involved, that shows Italian justice is working," Mr Delrio told reporters in Catania. A homicide investigation has been opened into the disaster, he added. Speaking about Sunday's disaster, in which only 28 of an estimated 700 migrants were rescued, Mr Salvi said hundreds had been locked below deck when the boat capsized. He said more passengers were locked inside cabins on another deck and hundreds more were crammed on to its upper deck. Earlier, EU foreign policy chief Federica Mogherini said the 10-point package set out at talks in Luxembourg was a "strong reaction from the EU to the tragedies" and "shows a new sense of urgency and political will". "We are developing a truly European sense of solidarity in fighting human trafficking - finally so." The measures include an increase in the financial resources of Frontex, which runs the EU's Mediterranean rescue service Triton, and an extension of Triton's operational area. As the talks took place late on Monday, Italy and Malta said at least two other rescues were taking place. Italian Prime Minister Matteo Renzi said one of the vessels was a dinghy off the Libyan coast with about 100-150 people on board. The other was a larger boat carrying 300 people. Earlier, the Greek coastguard said a vessel carrying dozens of migrants had run aground off the island of Rhodes. Three people had died and 80 were rescued, it said. 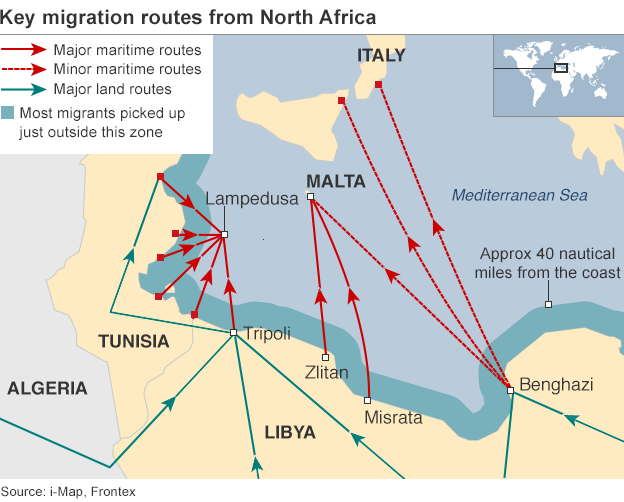 Maltese Prime Minister Joseph Muscat said Sunday's disaster off Libya was "a game changer", adding: "If Europe doesn't work together history will judge it very badly." Continued political instability in Libya has allowed human trafficking there to flourish. Ms Mogherini said they had discussed the possibility of supporting a government of national unity in Libya.